Rating: If you caught Discobeta‘s alpha-plus tune Chinese Robots on BBP’s Big Fat Mama Breaks compilation last year, you might have wondered why a tune this obviously all-conquering didn’t dominate a release centred around itself. Apparently BBP wondered the same thing, so prepare yourself for the march of Chinese Robots EP featuring a title track containing a positive earworm of a sample from some music off a Japanese newsclip. What? So it’s not original? No. But then neither was the music on the newsclip which turns out to have a been based on a popular Finnish polka from the 30s. 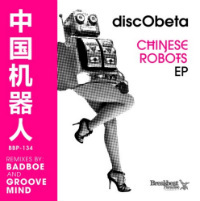 Also on the EP are Groove Mind’s more syncopated take on Chinese Robots and both the the ‘Funk 2da Brain’ and Badboe mixes of another glitchy-wobbly banger No Doubt. No doubt indeed.